Sucre is one of those cool little cities you end up spending more time in than you initially planned. Known as the White City and one of Bolivia’s capitals there are a tonne of things to do in Sucre Bolivia to keep you entertained. As one of the capitals strangely it feels less Bolivian than places like La Paz or Cusco. It’s wealthier, more modern and there aren’t a tonne of Cholitas walking around. It really does feel like you could be in one of the cities of Peru. All that being said though it’s a stunning place to set up shop from anywhere from a couple of days to a couple of weeks. Whether it be learning Spanish, walking with dinosaurs or partying, here are the 7 best things to do in Sucre. 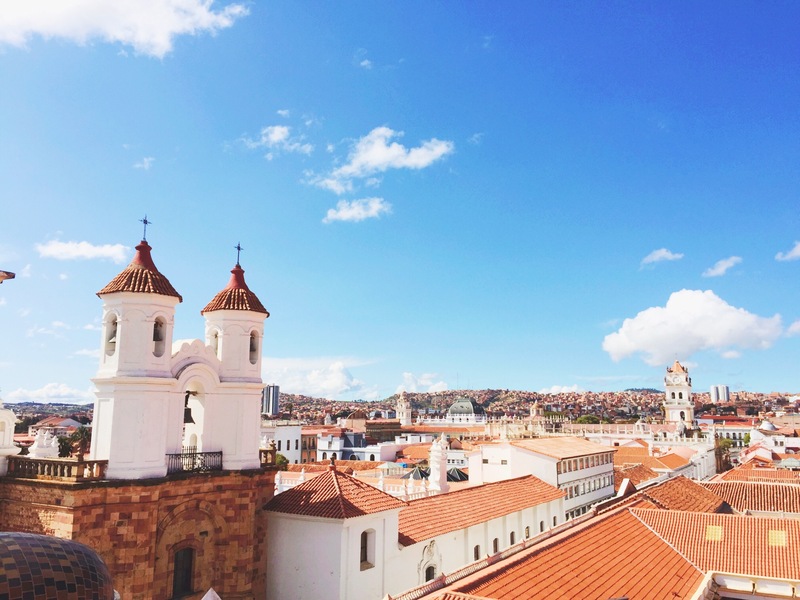 Because Sucre Bolivia is known as The White City you can imagine everything is well, white. Which gives it a pretty awesome look and a lovely Colonial vibe. It’s also UNESCO world heritage listed, so you know it’s good! Wandering around the cobblestoned streets learning about the city with a free walking tour Sucre with Condor Trekkers is one of the best things to do in Sucre Bolivia. 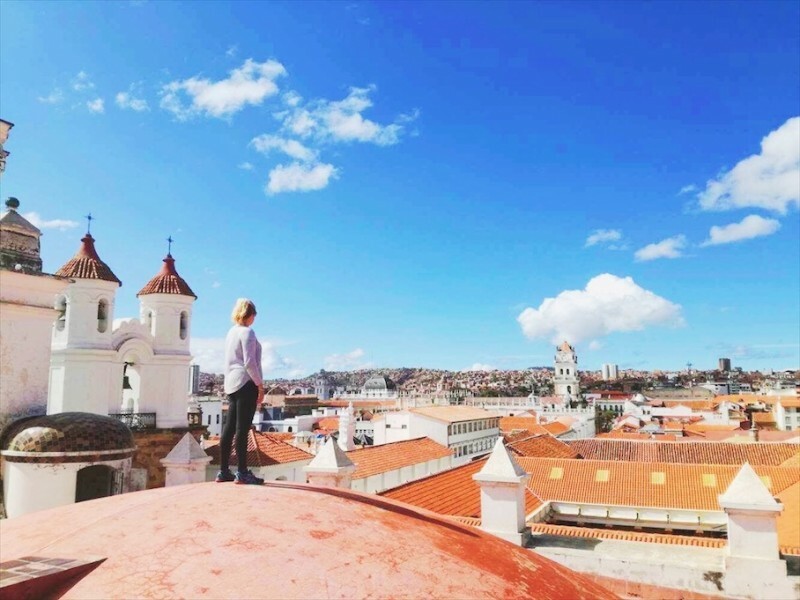 The three-hour tour takes you to the top things to see in Sucre Bolivia, like; Mercado Campesino; La Recoleta neighbourhood; Plaza 25 de Mayo and many more. 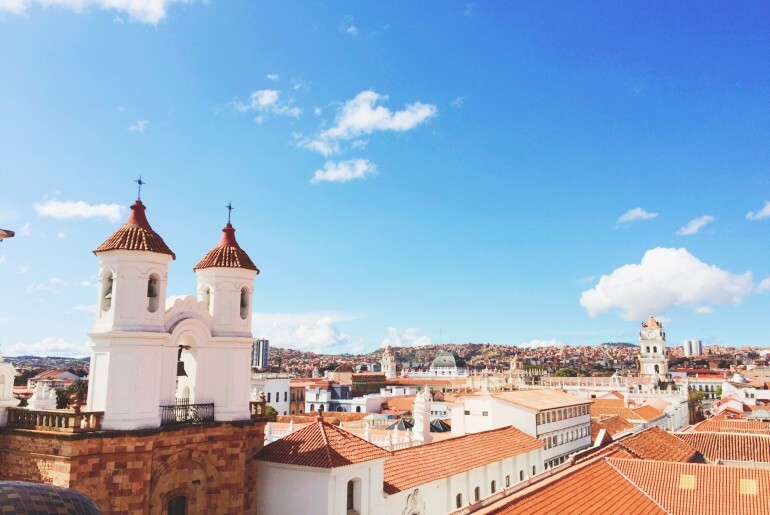 Quick Facts: Cost: Free + tip | Time Needed: 3 hours| Verdict: A nice way to explore the city when you’ve just landed and learn all the best things to do in Sucre Bolivia. Ok, so I know this is a weird option for Sucre Bolivia things to do. Buuuuut, it really seems like eating fried chicken is a thing to do here And also, it’s delicious, so why not. Every night of the week the fried chicken joints are absolutely packed with people and they are basically on every corner. Dona Lia was my favourite. We ate here a few times a week as it was close to our hostel and we were hungover a lot. There’s nothing fancy about it, but eating fried chicken is just one of the things to do in Sucre for some reason. How to Get To Dona Lia: From Plaza 25 De Mayo walk along Calle Audiencia towards the Joyride Cafe. Turn left down Calle Bolivar and then left again onto Calle Calvo. Dona Lia will be on your left. Quick Facts: Cost: $2+ | Time needed: As long as you like| Verdict: Not a Sucre must-do, however if you’re after a cheap delicious meal it’s definitely a top spot. This is the incredible view from the top of Iglesia La Merced. One of the best things to see in Sucre. As the city is surrounded by hills one of the best things to do in Sucre Bolivia is to take in the views. La Recoleta Sucre Viewpoint is the most popular spot to do this. The walk up here will take you about 20 minutes from the city and is a little steep. However, at the top, there are some lovely cafes and arches and the most beautiful panoramic view over the entire city (which apparently I didn’t take any photos of?). My next favourite spot to take in the splendour of the city was from the top of Iglesia La Merced. We stumbled upon this viewpoint when we were trying to visit the viewpoint at the bell tower of San Felipe Neri (another Sucre Bolivia attraction). Everything looks the same from ground level so we got the two confused. But we were pleasantly surprised after we climbed the rickety stairs to the top and were greeted with huge red domes which were the perfect spot to take in some 360-degree views of the city. Entry to the church costs 10 bs (Around $2 USD). How to Get To La Recoleta Sucre: From Plaza 25 De Mayo head right onto Calle Nicolas Oritz then turn left onto Calle Dalence. Continue walking up it for around 8 blocks till you reach the viewpoint. How to Get To Iglesia La Merced: From Plaza 25 De Mayo head right onto Calle Nicolas Oritz and walk for two blocks. Then turn left onto Calle Azurduy. The church will be on your right. Quick Facts: Cost: $2 | Time needed: As long as you like| Verdict: These are both some of the best things to see in Sucre. As Sucre is so cosmopolitan there are a number of awesome cafes to spend an afternoon at doing your Spanish homework. My favourites were The Condor Cafe Sucre (awesome cheap vegetarian menu del dia), Joy Ride Cafe Sucre (cute rooftop and delicious Gringo food) and Cosmo Cafe Sucre (serving up some of the best coffee in town). Joy Ride and Cosmo Cafe even stay open all night and turn into some of the best restaurants in Sucre Bolivia. An afternoon sipping coffee and doing my homework at one of these spots was definitely one of my favourite things to do in Sucre Bolivia. Quick Facts: Cost: $5+ | Time needed: As long as you like| Verdict: If you’re studying Spanish hitting up any of these cafes is one of the best things to do in Sucre Bolivia. 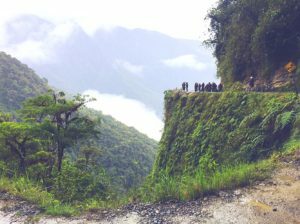 One of the biggest Sucre Bolivia attractions are its affordable Spanish schools. You’ll find a tonne of people on the Gringo Trail headed to Sucre for exactly that reason. 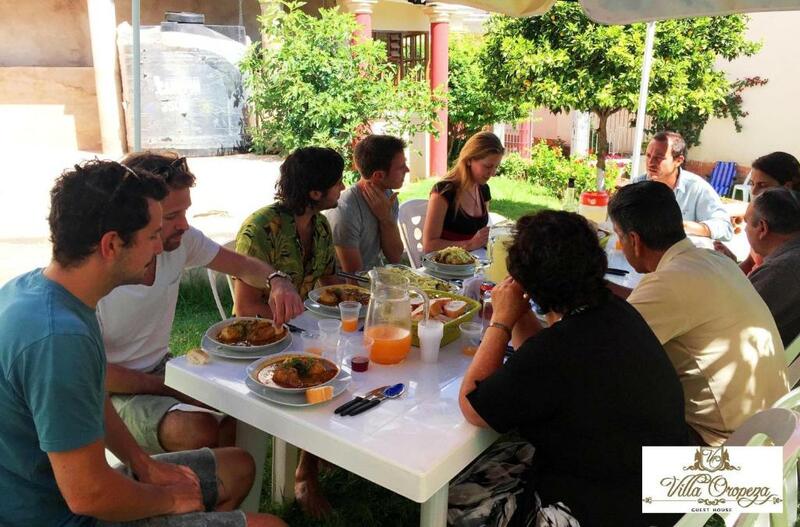 Spanish lessons at places like Sucre Spanish School and Open Spanish Sucre start at around $6 USD per hour. I studied at Sucre Spanish School and can highly recommend. The teachers were lovely and professional. They will also take you on excursions around Sucre as part of your lessons. So you get an understanding of the culture as well as the language. So if you’re wondering what to do in Sucre and you’ve got a bit of spare time, I’d definitely recommend taking some Spanish lessons. Quick Facts: Cost: $6 USD per hour+ | Time needed: Most schools will do about 3-4 hours per day| Verdict: If you want to improve your Spanish this is a must-do. Did you know one of the top things to do in Sucre is to visit the world’s largest collection of dinosaur footprints? Just 5km out of town you’ll find Parque Cretacico Sucre. It has a museum of lifesize models of the dinosaurs who left their footprints behind. And the Cal Orck’o wall which holds around 5,000 dinosaur prints. Some reaching trails of up to 20 metres long left millions of years ago. It’s pretty incredible! They run guided tours every day at 10 am, 11:30 am, 12:30 pm, 2 pm and 3 pm. And the best time to visit is between 12 – 2 pm as the sun is in the best spot to see the prints. How to Get To Parque Cretacico Sucre: There is a shuttle bus that runs from Plaza 25 de Mayo daily at 9:30 am, 12 pm and 2.30pm. The shuttle bus which is actually a truck painted with dinosaurs leaves from in front of the Cathedral and costs 15 bs (around $2 USD). Quick Facts: Cost: 30 bs ($4.50 USD) entry fee | Time needed: Around 2 hours| Verdict: This is definitely one of the more novel things to do in Sucre. And is a fun way to spend an afternoon. When we rolled into this quaint little city I really didn’t expect partying to be on my list of Sucre Bolivia things to do. However, we ended up staying in KulturBerlin hostel, one of the best party hostels in Bolivia. Every night of the week is a party. We were also in Sucre for St Patricks Day which meant even more drinking at the Irish Pub down the road. On Saturday night KulturBerlin is a top spot for locals. With traditional dance performances before it turns into a salsa club. How to Get To KulturBerlin Hostel Sucre: From Plaza 25 De Mayo walk along Calle Audiencia towards the Joyride Cafe. Then turn left onto Calle Avaroa. KulturBerlin will be on your right. Quick Facts: Cost: $2+ | Time needed: As long as you like| Verdict: If you’re in the mood partying at KulturBerlin is one of the most fun things to do in Sucre Bolivia. From budget hostels to cute boutique hotels the accommodation in Sucre Bolivia can be pretty hit and miss. But never fear here are my picks for the best places to stay in Sucre. This is definitely one of the best hostels in Sucre Bolivia. Awesome breakfast, very social all set in a big colonial villa. Another one of the best Sucre hostels. With a bbq, sun terrace and very social atmosphere. One of the top hotels in Sucre, located in an 18th-century Spanish style house, with terrace views of Sucre and lovely antique furniture. 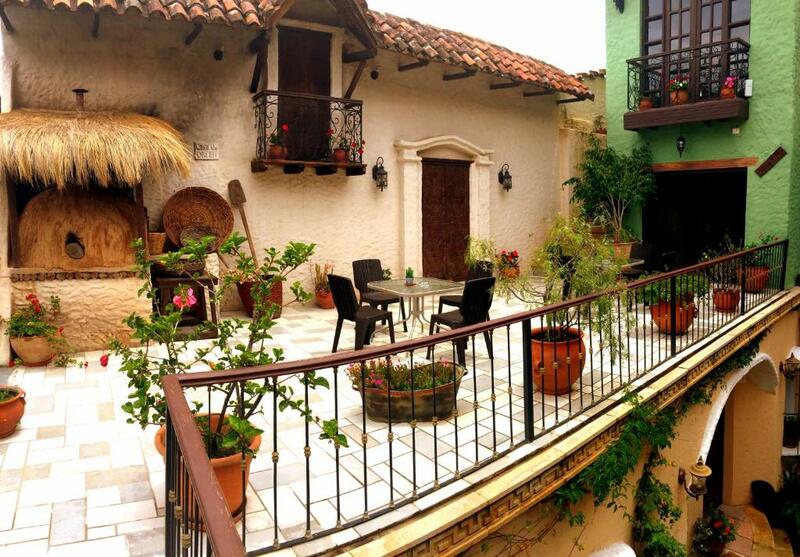 Stunning Sucre hotel with free breakfast, friendly staff and colonial style gardens. Close to the best things to do in Sucre Bolivia. There are two main ways of getting to Sucre Bolivia, either by flight or by bus. Bus is the most economic, however it will take a while and the buses in Bolivia are pretty old and smelly. But great if you’re low on budget and want an authentic experience. The main airport in Sucre is called Alcantari International Airport and is located 25km from town. There are daily flights with Boliviana de Aviación (BoA), Amaszonas and TAM to and from places like La Paz, Santa Cruz and Cochabamba. You can also reach Sucre internationally from Madrid, Buenos Aires, Salta and Sao Paulo. I like to compare flights with Kiwi.com as they have a great little tool that allows you to do a radius search. Which is great for trying to find the cheapest airports to fly into near your destination. Compare flights here. To take the bus from Santa Cruz to Sucre – Time: 15 – 16 hours | Cost: Semi-cama 90Bs ($13 USD), Full Cama 110Bs ($16 USD). 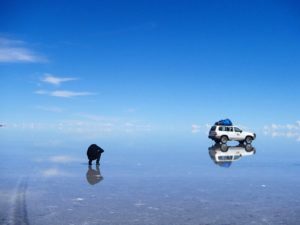 Bus from Uyuni to Sucre – Time: 10 hours | Cost: Semi-cama 80Bs ($112 USD), Full Cama 100Bs ($15 USD). Busing from Potosi to Sucre – Time: 3 – 4 hours | Cost: Semi-Cama 25Bs ($4 USD), Full Cama 35Bs ($5 USD). Buses also head to Sucre from Oruro, Cochabamba and Tarija. You can find out more information here. 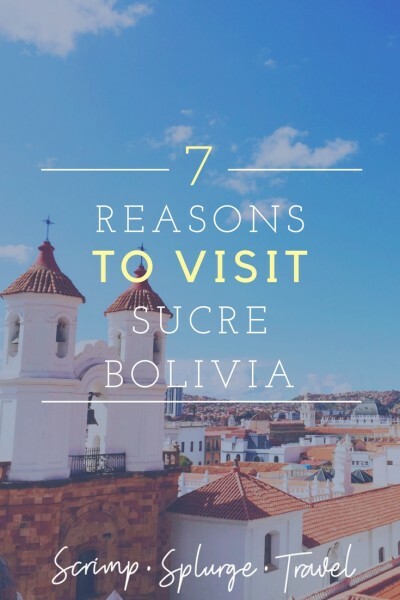 Over the Best Things To Do In Sucre Bolivia And Want To Explore More? There are links within this post – best things to do in Sucre Bolivia that I can earn commission on. This allows me to keep providing free travel tips and destination guides. If you’re thinking about purchasing something I have recommended I’d really appreciate it if you bought it through this site. All opinions as always remain my own.